I think my personal jury is out on whether I like mug rugs or not. This one is 7" by 12". Big enough for a coffee and a snack. This one is going in the mail tomorrow as a swap. I also finished all 16 of my Maple Leaf blocks. Tomorrow is the community outreach sewing afternoon. The local grocery store provides the work room free to not for profit groups. We have to take our sewing machines, irons, cutting boards etc. We are going to be making simple string blocks. Hope the weather co-operates. 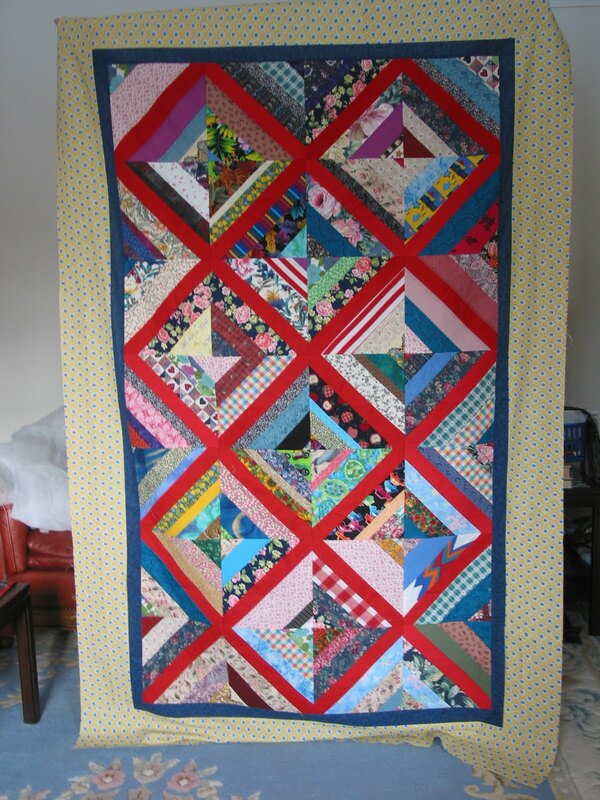 Barbara Brackman is posting a Civil War block of the week this year. Today's block was Seven Sisters. I am not much of an applique person so I tackled this one with considerable trepidation. I seemed to turn out OK.
What else have I been working on this week. Well some swap items. 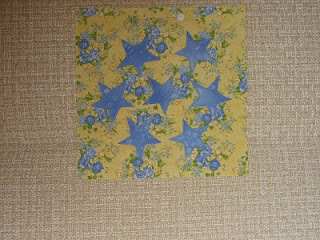 15 Maple Leaf blocks for an on-line Canadian group and my first Mugrug for another on-line group. 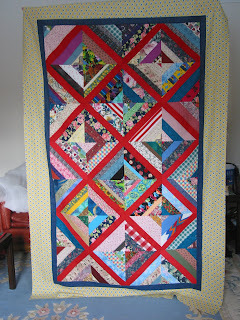 I have the blocks done for three more quilts but sewing them together may have to wait a couple of weeks. This is my first "blue" finish for January. 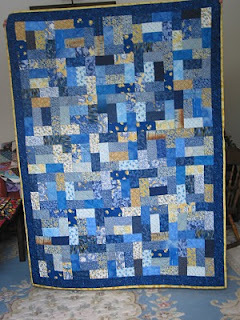 I say "blue" in quotes because there is yellow scattered through the quilt so strictly speaking it is not only blue. I call this a brick friendly block. Each piece is the same size. 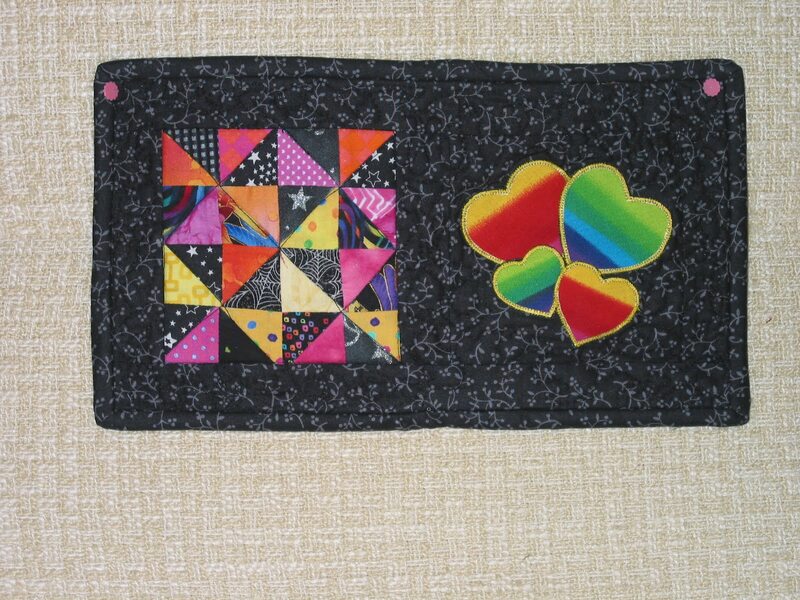 For this quilt all pieces are 2 1/2" by 4 1/2". The block works for 1 1/2" by 2 1/2" bricks and for 3 1/2" by 6 1/2" bricks. 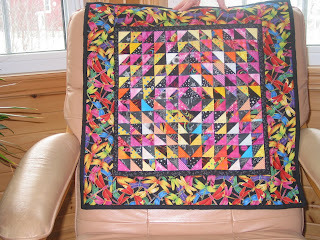 I will be leading a workshop for this block at our Scrap Bag quilters meeting in January. Whoever is leading the workshop prepares kits for the project they are leading. I have made 10 kits and at a minimum of 280 pieces per kit that was a lot of stash busted. This small doll quilt is for my Scrap Bag Quilters group. We give doll quilts to the toy drive at Christmas. 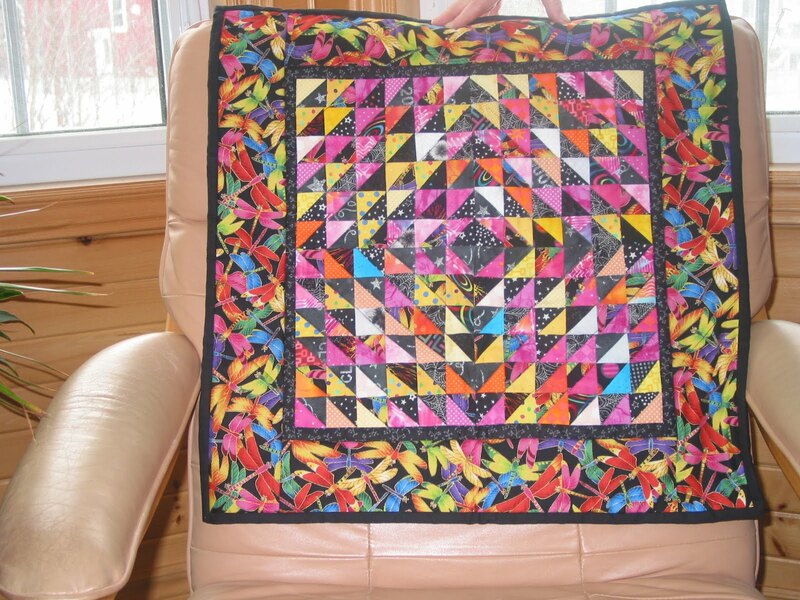 This one is made from the "waste" or "bonus" triangles from a quilt I made last year. Each HST is 1 1/4" finished. I sometimes get a little obsessed with using up bits. 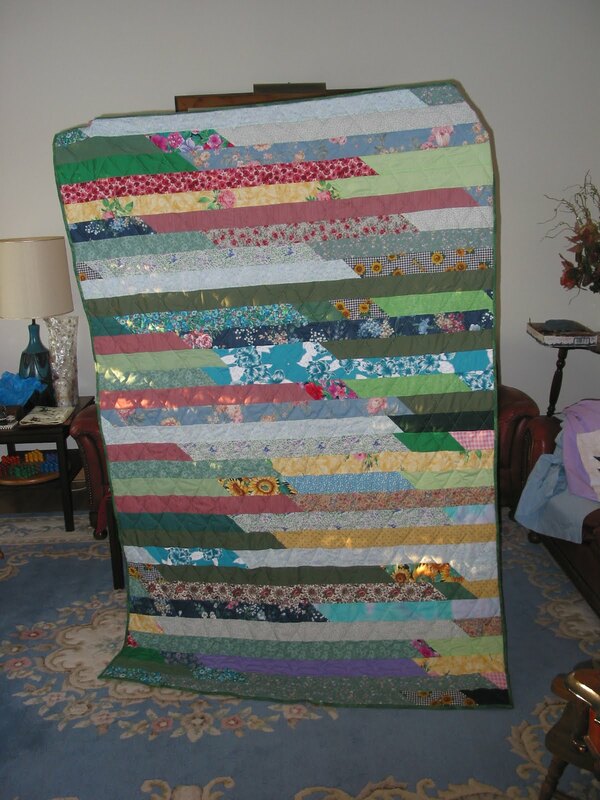 With regard to progress on my other challenges for this year I have completed 8 quilts in the 50 quilts from stash challenge. 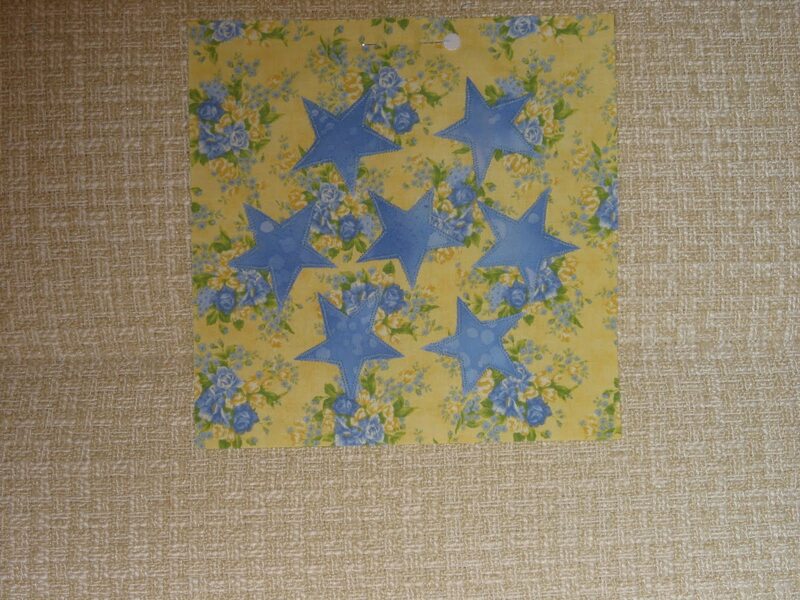 I have pulled my blue scraps out to look at them and make a decision about what to make and I found UFO #6. It was started the month before I was diagnosed with cancer three years ago. So going back to try to finish it is a little tough. But I have the perfect place to hang it if I can get it done. This is one of my final finishes for 2010. The style is called lasagna. Basically you sew a many mile long strip of same width scraps. A strip about 40m long makes a nice single bed size. Then fold it back on itself and sew the long side together. 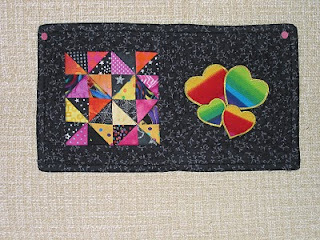 This step is repeated until you have a quilt the size and shape you want. 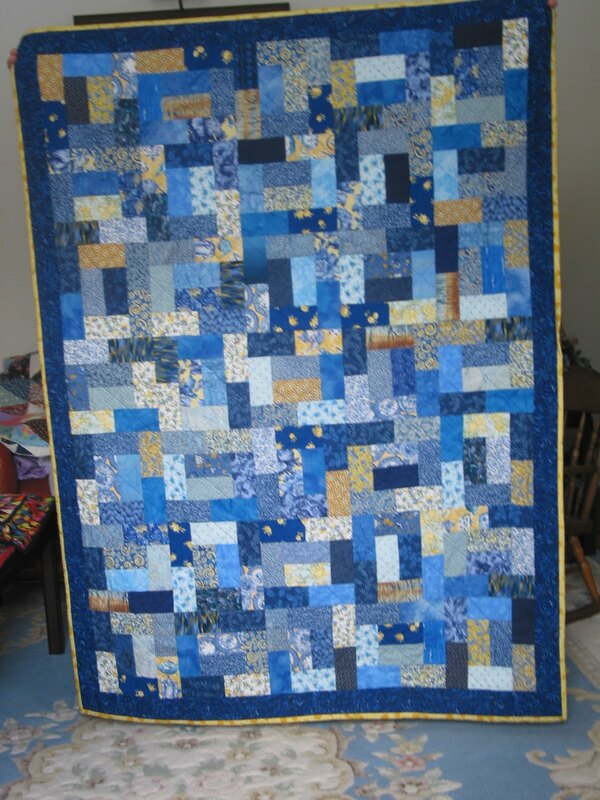 There are other variations for this style of quilt. This particular quilt was made from the last kit I got ready for my Scrap Bag Quilters group. The strips were 3 1/2" wide.